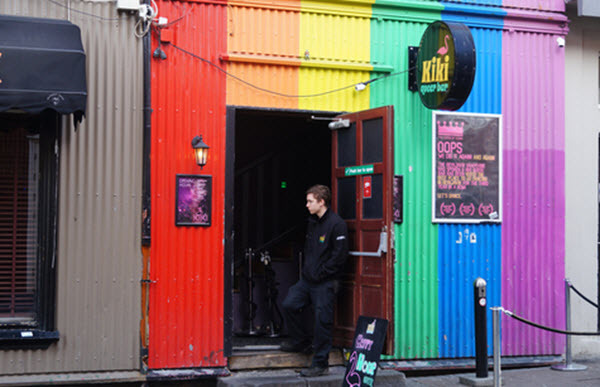 Gaybars. Grindr is not all bad news, however. Dating apps or sites are part of the liberal cultures. For some people , dating Apps has become part of their lifestyle. They see that they are not alone in the world and they can meet in a physical space like a gaybar or a club to meet each other. Before the internet, most gay meet like-minded people in gaybars, clubs or saunas, specifically gay venues . But now in the real digital life , most people meet outside the venues. Most of them looking after pretty faces and bodies and go for it. But like most of these , some pictures are too pretty to be true and give most of a cold shower afterwards. Now , we are on a mix world , bars and digital. Many people are using their apps while at a bar or club as a way to meet people. It has become the new way of pick-up line. In bars you see the real 'not photoshop' people as they are. No surprices or mistakes , no danger too drive meters away to empty places or wrong adresses. Dating apps are not only about dating . Some of them are just onsite for show and glamour , with strong muscles , tight underwear and some big things to see on Grindr . Now it is becoming too difficult to find new people because you have many visitors on these apps , to many exactly. For the lucky guest , you can try to do both ways. Go to the gay venue and meet someone on site with Grindr . It is very easy to use in gay venues and you are more like to meet good friends in a social way.